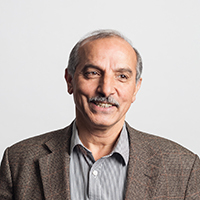 Professor Nouri graduated with a BSc (Hons) degree in Mechanical Engineering from Reading University in 1983. He undertook postgraduate research in Thermofluids Section at Imperial College of Science, Technology and Medicine, London University, leading to the Degree of Doctor of Philosophy in 1987. He joined the same research group at Imperial College in June 1987 as a Research Fellow. He has a wide experience in the field of the experimental fluid mechanics with expertise in optical techniques for flow diagnosis; a refractive index matching (RIM) method was developed allowing measurements by LDV in dense suspension flows and flows in very complex geometries. He carried out research on flow characteristics of multi-phase flows and Newtonian and non-Newtonian fluid flows, but since 1992 he was mainly involved in research on fluid mechanics, internal combustion engines, Gasoline and Diesel fuel spray processes, centrifugal pumps and turbo-chargers. He joined City in January 2001 and was appointed as a lecturer in the School of Engineering and Mathematical Sciences, SEMS. Following his appointment at City, he was promoted to Senior Lecturer in 2004, to Reader in Mechanical Engineering in 2008 and to Professor of Experimental Fluid Mechanics in 2011. His extensive research on fluid mechanics, Fuel injection system, internal combustion engines and application of optical diagnostics is noted by many journal publications and awards including the 2000 Arch T. Colwell Merit Award of the Society of Automotive Engineers. In August 2005 he was appointed Course Director for PG MSc Mechanical and Automotive Engineering and then appointed Assistant Dean for UG Mechanical, Energy and Automotive & Motor Sport Engineering in August 2007. He was appointed Assistant Dean for Mechanical Engineering and Aeronautics in August 2011. Nouri, J.M., Mackenzie, S., Gaskell, C. and Dhunput, A. (2012). Effect of viscosity, temperature and nozzle length-to-diameter ratio on internal flow and cavitation in a multi-hole injector. Fuel Systems for IC Engines (pp. 265–278). ISBN 978-0-85709-210-6. Nouri, J.M., Dasari, B.L., Brabazon, D. and Naher, S. (2017). Parametric study for graphene reinforced aluminum matrix composites production using Box Behnken design. Material Forming 26-28 April, Dublin, Ireland. Nouri, J.M. (2015). Influence of cavitation on near nozzle exit spray. CAV 2015. 9th Int. Symp. On Cavitation 6-10 December, Lausanne, Switzerland. Laksmi, B., Nouri, J.M., Brabazon, D. and Naher, S. (2015). PREDICTION OF PROPERTIES FOR THE PRODUCTION AND APPLICATION OF GRAPHENE REINFORCED METAL MATRIX COMPOSITES. Proceedings of SEEP2015 11-14 August, Paisley. Marchi, A., Yan, Y., Nouri, J.M. and Arcoumanis, C. (2013). Investigation on Flows Induced by Fuel Sprays from an Outwards Opening Pintle Injector for GDI engines. ILASS – Europe 2013 1-4 September, Chania, Greece. Gavaises, E., Mirshahi, M., Nouri, J.M. and Yan, Y.-.Y. (2013). Link between in-nozzle cavitation and jet spray in a gasoline multi-hole injector. 25th ILASS-Europe 1-4 September, Chania, Greece. Marchi, A., Yan, Y., Nouri, J.M. and Arcoumanis, C. (2013). PIV Investigation on Flows Induced by Fuel Sprays from an Outwards Opening Pintle Injector for GDI engines. ILASS – Europe 2013 1 Sep 2013 – 4 Dec 2013, Chania, Greece. Gavaises, E., Rewse-Davies, Z., Nouri, J.M. and Arcoumanis, C. (2013). Near-Nozzle Instabilities in Gasoline Direct Injection Sprays. 25th ILASS-Europe 1-4 September, Chania, Greece. Nouri, J.M., Mackenzie S., , Gaskell C., and Dhunput A., (2012). Effect of viscosity and temperature on in-nozzle flow and cavitation in a multi-hole injector. To be presented in IMechE Conference on Injection System for IC Engines May, London, England. Nouri, J.M. (2012). Effect of viscosity, temperature and nozzle length-to-diameter ratio on internal flow and cavitation in a multi-hole injector. IMechE - Fuel Systems for IC Engines One Birdc age Walk, London SW1H 9JJ. Mitroglou, N., Gavaises, M., Nouri, J.M. and Arcoumanis, C. (2011). Cavitation Inside Enlarged And Real-Size Fully Transparent Injector Nozzles And Its Effect On Near Nozzle Spray Formation. Droplet Impact Phenomena and Spray Investigations Workshop 2011 27 May, Bergamo, Italy. Nouri, J.M., Guerrato D., , Stosic N., , Smith, I. and Arcoumanis, C. (2009). Turbulent flow measurements within a screw compressor. 6th Int. Symposium on Turbulence, Heat and Mass Transfer THMT 14-18 September, Rome, Italy. Mitroglou, N., Nouri, J.M. and Arcoumanis, C. (2009). In-nozzle cavitating flow and ambient-temperature effects in high-pressure multi-hole gasoline sprays. Gavaises, M., Arcoumanis, C. and Nouri, J.M. (2008). The role of cavitation in fuel injection systems. Invited paper, 8th AVL International Symposium on Internal Combustion Diagnostics 10-11 June, Kurhaus Baden-Baden. Nouri, J.M., Marchi A., , Yan Y., and Arcoumanis, C., (2007). Internal flow and spray characteristics of a pintle-type outward opening piezo-injector. SAE 2007-01-1406 April. Mitroglou, N., Nouri, J.M., Gavaises, M., You-You, Y.A.N. and Arcoumanis, C. (2007). Spray structure generated by multi-hole injectors for gasoline direct injection engines. SAE Paper 2007-01-1417. Guerrato, D., Nouri, J.M., Stosic, N. and Arcoumanis, C. (2007). Flow and pressure characteristics within a screw compressor. Guerrato, D., Nouri, J.M., Stošić, N., Arcoumanis, C. and Smith, I.K. (2007). Flow development in the discharge chamber of a screw compressor. Nouri, J.M., Guerrato D., , Stosic N., and Arcoumanis, C., (2007). Axial flow and pressure characteristics within a double screw compressor. Stosic, N., Guerrato, D., Nouri, J.M. and Arcoumanis, C. (2007). Flow and Pressure Characteristics within Screw Compressor. Third International Conference on Optical & Laser Diagnostics (ICOLAD) London, England. Stosic, N., Guerrato, D., Nouri, J.M. and Arcoumanis, C. (2007). Flow Development through the Discharge Chamber of a Screw Compressor. International Conference Compressors and Their Systems London, England. Mitroglou, N., Nouri, J.M., Yan, Y. and Arcoumanis, C. (2007). Spray structure generated by multi-hole injectors for gasoline direct injection engines. SAE 2007-01-1417. Nouri, J.M., Mitroglou, N., Yan, Y. and Arcoumanis, C. (2007). Internal flow and cavitation in a multi-hole injector for gasoline direct injection engines. SAE 2007-01-1405. Nouri, J.M.,, , Hamid, M.A., Yan. Y, and Arcoumanis, C. (2005). Spray characterization of a piezo pintle-type injector for gasoline direct injection engines. 2nd Int. Conf. on Laser and Optical Diagnostics (ICOLAD) 12-14 September, City University London. Nouri, J.M., , Abo-Serie, E., Marchi, A., Mitroglou, N. and Arcoumanis, C. (2005). Internal and near nozzle flow characteristics from a model of an outwards opening gasoline direct injector. in 2nd Int. Conf. on Laser and Optical Diagnostics (ICOLAD) 12-14 September, City University London. Ous, T., Nouri, J.M., Gavaises, M. and Arcoumanis, C. (2005). Experimental investigation on the performance of proton exchange membrane fuel cell (PEM) for high power and water management. 2nd Int. Conf. Optical and Laser Diagnostics, ICOLAD, Exhibited paper 11-14 September, London, England. Nouri, J.M. and Whitelaw, J.H. (2003). Effect of chamber pressure on the spray structure from a swirl pressure atomiser for direct injection gasoline engines. Mitroglou, N., Nouri, J.M. and Arcoumanis, C. (2003). Spray characteristics of a multi-hole injector for direct injection gasoline engines. Nouri, J.M. and Whitelaw, J. H., (2002). Effect of back pressures on spray characteristics generated from a GDI swirl atomizer. 1St Int. Conf. Optical and Laser Diagnostics, ICOLAD 16-20 December, London, England. Nouri, J.M., Brehm, C., and Whitelaw, J. H., (1999). The spray from a gasoline direct injection. ILASS99 Symposium 5-7 July, Toulouse, France. Arcoumanis, C., Nouri, J.M., Gavaises, M. and Horrocks, R.W. (1998). Analysis of the Flow in the Nozzle of a Vertical Multi-Hole Diesel Engine Injector. SAE 23-26 February, Detroit, Michigan. Arcoumanis, C., Martinez-Botas, R.F., Nouri, J.M. and Su, C.C. (1998). Inlet and exit flow characteristics of mixed flow turbines. Arcoumanis, C., Gavaises, M. and Nouri, J.M. (1997). Investigation of the flow inside the sac volume and the injection holes of a diesel injector. 13th Annual Conference on Liquid Atomisation and Spray Systems (ILASS-Europe) 9-11 July, Florence, Italy. Arcoumanis, C., French, B. and Nouri, J.M. (1997). Steady Intake Flow Characteristics through the intake valves of a Ford Four-Valve Diesel Cylinder Head. 8th International Symp. on Applications of Laser Techniques to Fluid Mech. 8 Jul 1996 – 11 Jul 1996, Lisbon, Portugal. Arcoumanis, C., Nouri, J.M. and Andrews, R.J. (1992). Application of Refractive Index Matching to a Diesel Nozzle Internal Flow. 6th Int. Symp. on the Application of Laser Techniques to Fluid Mechanics 20-23 July, Lisbon, Portugal. Arcoumanis, C., Nouri, J.M. and Andrews, R.J. (1992). Measurement of the Internal Fluid Flow in a Diesel Injector using Refractive Index Matching. in IMechE Seminar on Diesel Fuel Injection Systems 14-15 April, London, England. Nouri, J.M. and Whitelaw, J. H., (1990). Effects of size and confinement on the flow characteristics in stirred reactors. 5th International Symposium on Applications of Laser Techniques to Fluid Mechanics July. Nouri, J.M., Liu, C. H., , Vafidis, C., and Whitelaw, J.H., (1990). Experimental study of flow in a centrifugal pump. 5th International Symposium on Applications of Laser Techniques to Fluid Mechanics July. Nouri, J.M., Hockey, R. M., and Pinho, F., (1989). Flow visualization of Newtonian and non-Newtonian fluids in stirred reactor. 3rd International Symposium on Flow Visualization. Prague. Nouri, J.M., Whitelaw, J.H. and Yianneskis, M. (1987). The scaling of the flow field with impeller size and rotational speed in a stirred reactor. Glasgow, Scotland. Dasari, B.L., Morshed, M., Nouri, J.M., Brabazon, D. and Naher, S. (2018). Mechanical properties of graphene oxide reinforced aluminium matrix composites. Composites Part B: Engineering, 145, pp. 136–144. doi:10.1016/j.compositesb.2018.03.022 . Dasari, B.L., Nouri, J.M., Brabazon, D. and Naher, S. (2017). Parametric study for graphene reinforced aluminum matrix composites production using Box Behnken design. AIP Conference Proceedings, 1896. doi:10.1063/1.5008155 . Zhang, K., Ghobadian, A. and Nouri, J.M. (2017). Comparative study of non-premixed and partially-premixed combustion simulations in a realistic Tay model combustor. Applied Thermal Engineering, 110, pp. 910–920. doi:10.1016/j.applthermaleng.2016.08.223 . Dasari, B.L., Nouri, J.M., Brabazon, D. and Naher, S. (2017). Graphene and derivatives – Synthesis techniques, properties and their energy applications. Energy, 140, pp. 766–778. doi:10.1016/j.energy.2017.08.048 . Mirshahi, M., Yan, Y. and Nouri, J.M. (2015). Influence of cavitation on near nozzle exit spray. Journal of Physics: Conference Series, 656(1). doi:10.1088/1742-6596/656/1/012093 . Kim, S., Yan, Y., Nouri, J.M. and Arcoumanis, C. (2013). Effects of intake flow and coolant temperature on the spatial fuel distribution in a direct-injection gasoline engine by PLIF technique. Fuel, 106, pp. 737–748. doi:10.1016/j.fuel.2012.10.002 . Kim, S., Yan, Y., Nouri, J.M. and Arcoumanis, C. (2012). Effects of intake flow and coolant temperature on the spatial fuel distribution in a direct-injection gasoline engine by PLIF technique. Fuel. Nouri, J.M., Kim S., , Yan Y., and Arcoumanis C., (2011). Effects of intake flow and coolant temperature on the spatial fuel distribution in a spray-guided DISI engine using PLIF. Int. J. Fuel..
Nouri, J.M., Marchi A., , Yan Y., and Arcoumanis, C., (2010). Spray stability of outwards opening pintle injectors for stratified DISI engine operation. IJER, 11, pp. 1–25. Kim, S., Nouri, J.M., Yan, Y. and Arcoumanis, C. (2009). Effects of intake flow on the spray structure of a multi-hole injector in a DISI engine. International Journal of Automotive Technology, 10(3), pp. 277–284. doi:10.1007/s12239-009-0032-2 . Mitroglou, N., Nouri, J.M. and Arcoumanis, C. (2009). Spray structure from double fuel injection in multihole injectors for gasoline direct-injection engines. Atomization and Sprays, 19(6), pp. 529–545. Guerrato, D., Nouri, J.M., Stosic, N., Arcoumanis, C. and Smith, I.K. (2008). Flow measurements in the discharge port of a screw compressor. Proceedings of the Institution of Mechanical Engineers, Part E: Journal of Process Mechanical Engineering, 222(4), pp. 201–210. doi:10.1243/09544089JPME200 . Nouri, J.M., Guerrato, D., Stosic, N. and Arcoumanis, C. (2008). Axial flow characteristics within a screw compressor. HVAC and R Research, 14(2), pp. 259–274. doi:10.1080/10789669.2008.10391007 . Nouri, J.M. and Hockey, R., (2008). Flow characteristics of Newtonian and non-Newtonian fluids in a vessel stirred by a 60° pitched blade impeller. Int. J Multiphysics, 2(1), pp. 83–105. Nouri, J., Stosic, N., Arcoumanis, C. and Guerrato, D. (2008). Axial Flow Characteristics within a Screw Compressor. HVAC&R Research, 14(2), pp. 259–274. doi:10.1080/10789669.2008.10391007 . Nouri, J.M., Marchi, A., Yan, Y. and Arcoumanis, C. (2008). Internal flow and spray characteristics of a pintle-type outward opening piezo-injector. Transactions Journal of Passenger Cars: Mechanical, 116(6), pp. 915–934. doi:10.4271/2007-01-1406 . Marchi, A., Nouri, J.M., Yan, Y. and Arcoumanis, C. (2007). Internal flow and spray characteristics of pintle-type outwards opening piezo injectors for gasoline direct-injection engines. SAE Technical Papers. doi:10.4271/2007-01-1406 . Nouri, J.M., Hamid, M.A., Yan, Y. and Arcoumanis, C. (2007). Spray characterization of a piezo pintle-type injector for gasoline direct injection engines. Journal of Physics: Conference Series, 85(1). doi:10.1088/1742-6596/85/1/012037 . Nouri, J.M., Abo-Serie, E., Marchi, A., Mitroglou, N. and Arcoumanis, C. (2007). Internal and near nozzle flow characteristics in an enlarged model of an outwards opening pintle-type gasoline injector. Journal of Physics: Conference Series, 85(1). doi:10.1088/1742-6596/85/1/012035 . Kim, S., Nouri, J.M., Yan, Y. and Arcoumanis, C. (2007). Effects of intake swirl and coolant temperature on spray structure of a high pressure multi-hole injector in a direct-injection gasoline engine. Journal of Physics: Conference Series, 85(1). doi:10.1088/1742-6596/85/1/012003 . Nouri, J.M. and Whitelaw, J.H. (2007). Gasoline sprays in uniform crossflow. Atomization and Sprays, 17(7), pp. 621–640. Nouri, J., Mitroglou, N., Yan, Y. and Arcoumanis, D. (2007). Internal flow and cavitation in a multi-hole injector for gasoline direct-injection engines. SAE Technical Papers p. 2007. doi:10.4271/2007-01-1405 . Marchi, A, , Nouri, J.M., Yan, Y. and Arcoumanis, C. (2007). Internal flow and spray characteristics of a pintle-type outwards opening piezo-injector. Transactions Journal of Passenger Cars –Mechanical Systems, SAE Paper 2007-01-1406. Kim, S., Nouri, J.M., Yan, Y. and Arcoumanis, C. (2007). Effects of intake swirl and cooling temperature on spray structure generated by a high pressure gasoline multi-hole injector. Journal of Physics: Conference Series, 85(1). Mitroglou, N., Nouri, J.M., Gavaises, M. and Arcoumanis, C. (2006). Spray characteristics of a multi-hole injector for direct-injection gasoline engines. International Journal of Engine Research, 7(3), pp. 255–270. doi:10.1243/146808705X62922 . Nouri, J.M. and Whitelaw, J.H. (2006). Impingement of high-pressure gasoline sprays on angled surfaces. Atomization and Sprays, 16(6), pp. 705–725. Theodorakakos, A., Ous, T., Gavaises, M., Nouri, J.M., Nikolopoulos, N. and Yanagihara, H. (2006). Dynamics of water droplets detached from porous surfaces of relevance to PEM fuel cells. Journal of Colloid and Interface Science, 300(2), pp. 673–687. doi:10.1016/j.jcis.2006.04.021 . Nouri, J.M., Mitroglou, N, , Gavaises, M., and Arcoumanis, C., (2005). Flow and spray characteristics in spray-guided direct injection engines. International Journal of Engine Research, 7(3), pp. 255–270. Nouri, J.M. and Whitelaw, J.H. (2001). Spray characteristics of a gasoline direct injector injector with short durations of injection. Experiments in Fluids, 31(4), pp. 377–383. doi:10.1007/s003480100302 . Arcoumanis, C., Gavaises, M., Nouri, J.M., Abdul-Wahab, E. and Horrocks, R.W. (1998). Analysis of the flow in the nozzle of a vertical multi-hole diesel engine injector. SAE Technical Papers. doi:10.4271/980811 . Arcoumanis, C., Gavaises, M., Nouri, J.M., Abdul-Wahab, E. and Horrocks, R.W. (1998). Analysis of the flow in the nozzle of a vertical multi hole diesel engine injector. SAE Special Publications, 1316, pp. 109–123. Nouri, J.M. and Hockey, R.M. (1998). Power Number Correlation between Newtonian and Non-Newtonian Fluids in a Mixinq Vessel. Journal of Chemical Engineering of Japan, 31(5), pp. 848–852. doi:10.1252/jcej.31.848 . Arcoumanis, C., Martinez-Botas, R.F., Nouri, J.M. and Su, C.C. (1997). Performance and exit flow characteristics of mixed-flow turbines. International Journal of Rotating Machinery, 3(4), pp. 277–293. doi:10.1155/S1023621X97000262 . Nouri, J.M. and Whitelaw, J.H. (1997). Flow of Newtonian and non-Newtonian fluids in an eccentric annulus with rotation of the inner cylinder. International Journal of Heat and Fluid Flow, 18(2), pp. 236–246. doi:10.1016/S0142-727X(96)00086-0 . Distelhoff, M.F.W., Marquis, A.J., Nouri, J.M. and Whitelaw, J.H. (1997). Scalar Mixing Measurements in Batch Operated Stirred Tanks. Canadian Journal of Chemical Engineering, 75(4), pp. 641–652. doi:10.1002/cjce.5450750401 . Arcoumanis, C., Nouri, J., Xu, H.M. and Stone, R. (1997). Analysis of the Steady Flow Characteristics of Tumble-Generating Four-Valve Cylinder Heads. Optical Diagnostics in Engineering, 2(2), pp. 71–83. Distelhoff, M. F. W., , Marquis, A. J., , Nouri, J.M. and Whitelaw, J. H., (1997). Power and concentration measurements in a stirred tank with different impellers. The Canadian Journal of Chemical Engineering, 75, pp. 641–652. Nouri, J.M., Arcoumanis, C., , Stone, R., and Xu, H. M., (1997). Further investigation on the steady flow characteristics of tumbling motion. Optical Diagnostics in Engineering, 2(2), pp. 71–83. Hockey, R.M. and Nouri, J.M. (1996). Turbulent flow characteristics with a 60 degrees pitched blade impeller in a stirred vessel. Chemical Engineering Science, 51(19), pp. 4405–4421. Nouri, J.M. and Whitelaw, J.H. (1996). Flow characteristics of an underexpanded jet and its application to the study of droplet breakup. Experiments in Fluids, 21(4), pp. 243–247. doi:10.1007/BF00190673 . Distelhoff, M.F.W., Laker, J., Marquis, A.J. and Nouri, J.M. (1995). The application of a strain gauge technique to the measurement of the power characteristics of five impellers. Experiments in Fluids, 20(1), pp. 56–58. doi:10.1007/BF00190598 . NOURI, J. and WHITELAW, J. (1994). FLOW OF NEWTONIAN AND NON-NEWTONIAN FLUIDS IN A CONCENTRIC ANNULUS WITH ROTATION OF THE INNER CYLINDER. Transactions of ASME, Journal of Fluid Engineering, 116(4), pp. 821–827. Nouri, J.M. and Whitelaw, J.H. (1994). Flow characteristics of hyperboloid stirrers. The Canadian Journal of Chemical Engineering, 72(5), pp. 782–791. doi:10.1002/cjce.5450720503 . Nouri, J.M., Umur, H. and Whitelaw, J.H. (1993). Flow of Newtonian and Non-Newtonian Fluids in Concentric and Eccentric Annuli. Journal of Fluid Mechanics, 253, pp. 617–641. doi:10.1017/S0022112093001922 . Nouri, J.M. and Whitelaw, J.H. (1992). Particle velocity characteristics of dilute to moderately dense suspension flows in stirred reactors. International Journal of Multiphase Flow, 18(1), pp. 21–33. doi:10.1016/0301-9322(92)90003-Y . Arcoumanis, C., Nouri, J.M., Whitelaw, J.H., Cook, G. and Foulkes, D.M. (1991). Coolant flow in the cylinder head/block of the ford 2.5L di diesel engine. SAE Technical Papers. doi:10.4271/910300 . Arcoumanis, C., Nouri, J.M., Whitelaw, J.H., Cook, G. and Foulkes, D.M. (1991). Coolant flow in the cylinder head/block of the Ford 2.5L DI diesel engine. SAE Technical Paper Series. NOURI, J. and WHITELAW, J. (1990). FLOW CHARACTERISTICS OF STIRRED REACTORS WITH NEWTONIAN AND NON-NEWTONIAN FLUIDS. AICHE J, 36(4), pp. 627–630. LIU, C.H., NOURI, J.M., WHITELAW, J.H. and TSE, D.G.N. (1989). PARTICLE VELOCITIES IN A SWIRLING, CONFINED FLOW. COMBUSTION SCIENCE AND TECHNOLOGY, 68(4-6), pp. 131–145. doi:10.1080/00102208908924073 . Nouri, J.M., Whitelaw, J.H, and Yianneskis, M., (1988). A refractive index matching technique for solid/liquid flows. Laser Anemometry in Fluid Mechanics, 3, pp. 335–340. Nouri, J.M., Whitelaw, J.H. and Yianneskis, M. (1987). Particle motion and turbulence in dense two-phase flows. International Journal of Multiphase Flow, 13(6), pp. 729–739. doi:10.1016/0301-9322(87)90062-0 . Nouri, J.M., Whitelaw, J.H. and Yianneskis, M. (1987). The scaling of the flow field with impeller size and rotational speed in a stirred reactor. .
Nouri, J.M., Whitelaw, J.H. and Yianneskis, M. (1987). The scaling of the flow field with impeller size and rotational speed in a stirred reactor. , ((eds. ), Cranfield, U.K.,BHRA, 1987, Paper 35, p.489-500. ).